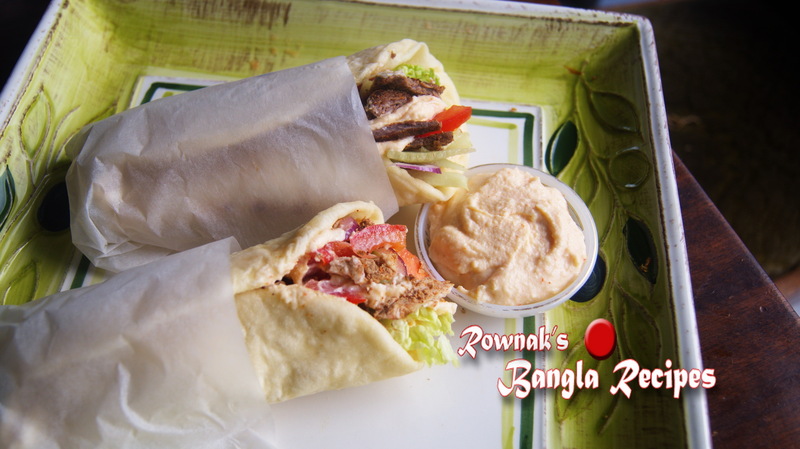 Shawarma Kabab is not actually Bangladeshi Food but very popular in Bangladesh. Sauce varies store to store and country to country. Even you can use mayonnaise as a sauce. It’s a bit long process though very easy and hard to go wrong. Enjoy. For mix all ingredients except papaw paste and oil and divide into two. 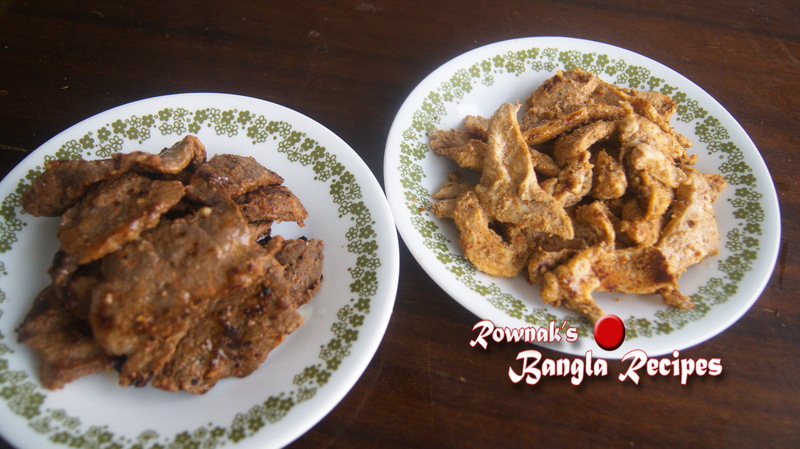 Marinate one with chicken and add papaw paste in other before marinate beef. Meat needs to marinate 4 hours to overnight. Take 1/3 cup lukewarm water and dissolve sugar and yeast together. Let it stands for 5-109 minutes or till yeast mixture becomes double up. 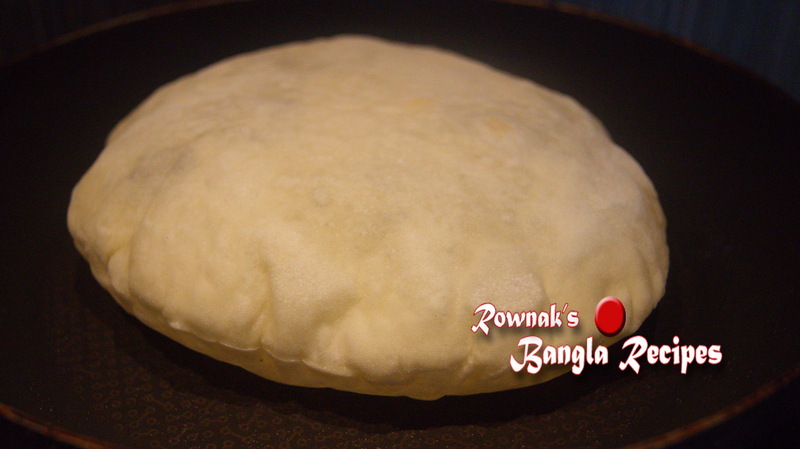 Add flour, salt and lukewarm water with yeast mixture and knead well to soft and stick dough. Add oil and knead again. Cover it the dough and let it rise in warm place for 1 hour or till it doubles up. Punch down dough. 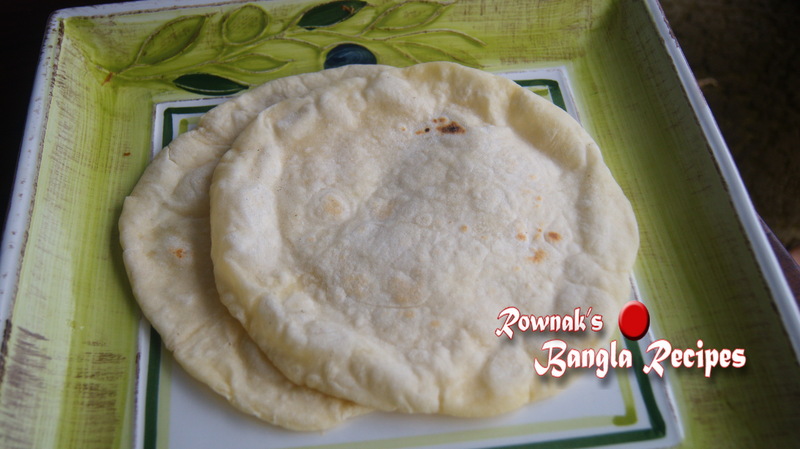 Divide dough in 6-7 balls and roll each ball into flat bread using flour and pan fry it like roti. You bake it too if you want. 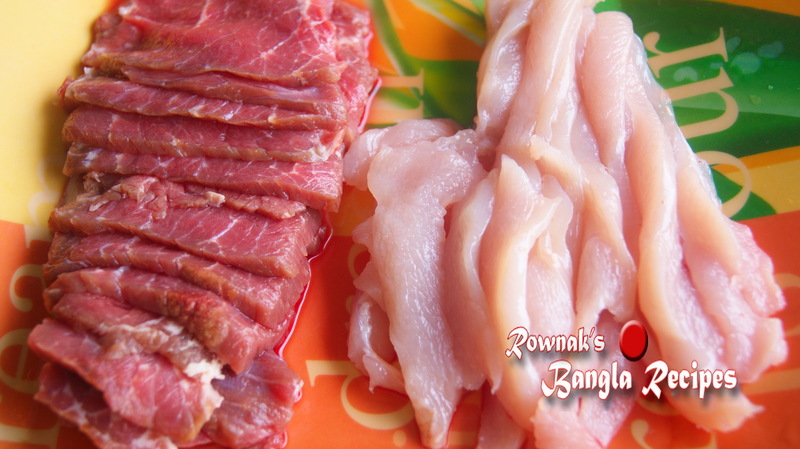 Fry two types of meat separately with bit of oil till each becomes cooked and slightly charred. You can chop meat after cooking if you want. For sauce add all the ingredients into a blender including the boiled potato and garlic. Blend until completely smooth. Sauce will be sticky and thick. Adjust salt to your taste. If you want you can roast (fry) garlic but raw has better taste and flavour. Cut all salad ingredients into thin slices. 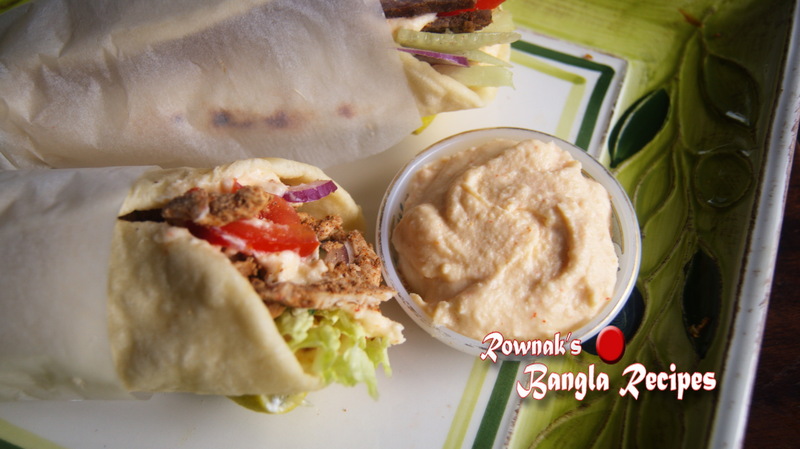 Take a bread and spread some sauce; add salad, meat pieces (use chicken for Chicken Shawarma and beef for Beef Shawarma) and bit more sauce; wrap it and secure it with foil or tooth pick. Although the process is little a bit lengthy but hope it will give better test comparing to Arabic Shawarma which is very fimiliar in Arab Countries, a speciality of Labaniese receipe. I haven’t seen you for ages. Missed your precious comment and advice. It is bit lengthy process but it is simple and easy and you know the pleasure to enjoy home-made food. Thanks.